No matter how much snow I saw on the ground this morning, I’m still refusing to acknowledge any other season right now but spring! Really though, living in Canada is amazing EXCEPT for our extreme weather situation. Yesterday we had shingles fly off of our roof – our roof that is only 5 years old! Of course we were the only house on the street because we are the last on the end where it’s the most windy, so we had to rush someone over today to fix it. It was basically the last thing I expected to happen! The bright spot with this turn in the weather (again) is that we have some fun travel plans coming up in a few months where our only worry will be about how hot it is! For now I’m trying to ignore the weather and adapt. My favourite way to do that right now is wearing long skirts and heavy sweaters. 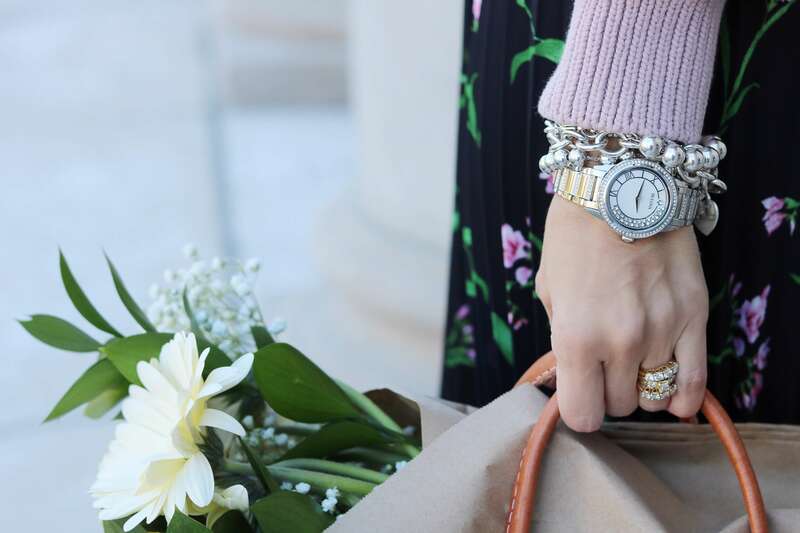 This outfit started with my new watch provided by Bulova – the new Women’s Crystal TurnStyle Watch. 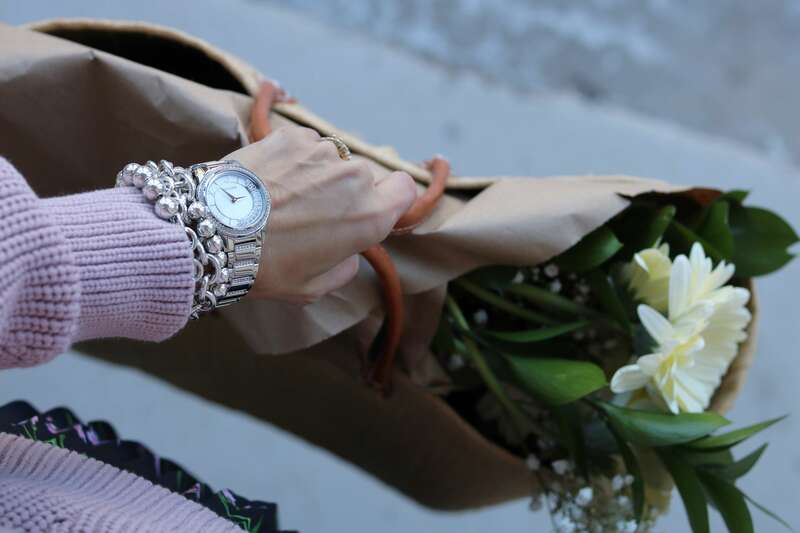 It fits in perfectly with my every day bracelets – they are all just the right match, so I’ve been wearing this watch non-stop since I received it. I’m much more into wearing bracelets rather than necklaces or earrings, so I love that this watch looks like a piece of jewelry! This week I’ve been preparing the invitations for my son’s birthday party – it’s only one month away, and I’m doing some really fun things for the kids which means a lot of prep work. I can’t wait to share the cute invitations – hopefully the kids will love them! I’ll be blogging about this party because it’s going to be so much fun! I just love throwing a good party!